Hillary Clinton, in her original email excuse appearance inside the UN in March, said ” First, when I got to work as secretary of state, I opted for convenience to use my personal email account, which was allowed by the State Department, because I thought it would be easier to carry just one device for my work and for my personal emails instead of two.” It would have probably been even easier to carry one device than it was the thirteen that she had over the course of her time as Secretary of State and much easier to keep track of them all. In fact, it seems that the only device Clinton was able to keep tabs on was her latest and primary one. The others, according to those around her, those that didn’t receive the smashed by a hammer treatment, simply seemed to vanish with the sensitive information on them. 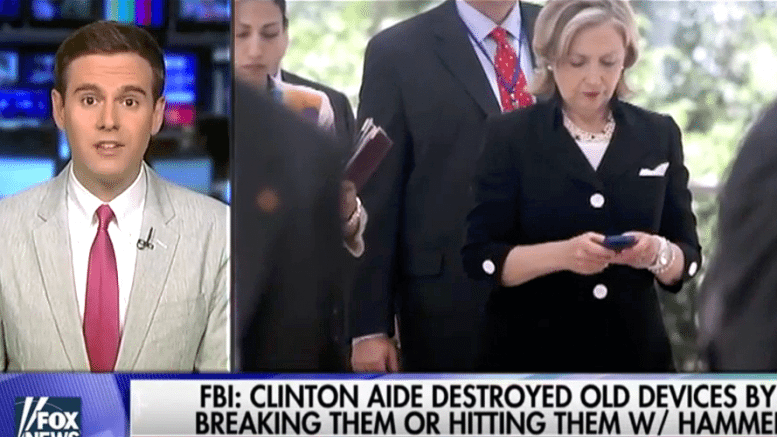 The Daily Caller reports, “Clinton aides told FBI investigators the former diplomat went through phones often, and the ‘whereabouts’ of her old phones would become unknown once she switched to a new device.” Whether they were sold, carelessly discarded, burned, or given out as souvenirs to hackers of various nationalities is unknown, or at least not admitted to. One aide, Justin Cooper recalled at least two instances where he “destroyed” the secretary’s old Blackberry cell phones, according to FBI documents by “breaking them in half or hitting them with a hammer,” according to investigators. 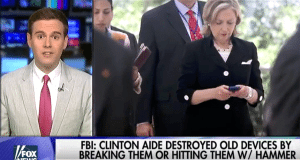 He also addresses the issue of the timeline in which her “team began to purge and scrub her email archives which were under Congressional subpoena at the time, a few weeks after the New York Times first reported the existence of her server. “If that is not obstruction or intent, I don’t know what is,” he says. Benson’s comments are in the first video below, followed by a second one in which the lies from Clinton’s infamous briefing in the UN are refuted one by one by FBI Director James Comey. Powell Told Clinton To Transfer Govt Docs To Her Home – Really, NYT? Huckabee Sets Trump Straight! Will Trump Listen! ?